Recording Industry vs The People: RIAA Opposes EFF's Motion for Leave to File Amicus Brief in Lava v. Amurao, Attacks "Recording Industry vs The People"
RIAA Opposes EFF's Motion for Leave to File Amicus Brief in Lava v. Amurao, Attacks "Recording Industry vs The People"
In Lava v. Amurao, the RIAA has opposed the motion made by the Electronic Frontier Foundation for permission to file an amicus brief. Among other things, the RIAA argued that Ray Beckerman, who had acted as local counsel in filing the EFF's motion, publishes "Recording Industry vs. The People", which, the RIAA said, had accused the Plaintiffs of acting as "a cartel of multinational corporations [that] collude to absuse our judicial system, distort copyright law, and frighten ordinary working people and their children". (Brief at Page 4, FN 1). Besides, in the time that I have read this blog, I have never once read Ray accuse the RIAA of being a cartel. The FTC did(see Electra v Santalego II [footnote 4 of answer and counterclaims]), all of the defendants in the cases that I've read did, but not Ray. If anything, Ray brought these cases with a fair and open mind, unwilling to tell the story how the RIAA sees it. (1) Amici would certainly assist the court in understanding a complex issue with little previous litigation history for guidance. Little previous litigation history, due to the RIAA's now well-known tactic of dismissing cases and running rather than face an actual courtroom. (2) The amici certain has demonstrated a special interest in the subject matter of this suit. To deny the EFF's interest in an Internet p2p filesharing copyright infringment case would be akin to denying the ACLU's interest in a First Amendment issue. (3) Existing Devense counsel has certainly welcomed the assistance of the EFF. In fact, they've invited in the especially well-written brief. In the case of (1), (2), or (3) above, admitting the amici wins on all three! On the argument of only allowing an amicus brief when a party is not represented competently, with full and complete apologies to Ray, Ray you're a lawyer, not an Information Technology specialist. The issues here require a great degree of computer knowledge that you've not had time to acquire. The same applies for the Judge, who will need to understand issues specific to computers, the computer industry, the Internet, what and how computers actually work, and how programs work on those computers -- let alone how copyright law applies in all of these circumstances. Anyone with knowledge in any of these areas is certainly providing necessary assistance, and the EFF lives in this world. And the EFF certainly has information and perspective that can help the court well beyond what the lawyers from either side can provide. Contrary to the RIAA's contention, ALL OF THE FACTORS justifying submission of an amicus brief would appear to be present here! And it's funny to watch the RIAA railing against "conclusory, unsupported assertions." Well, they would certainly appear to be the experts in this area. Also the RIAA's argument that the EFF adds nothing new, will not aid the court in the least, and just waste time while not assist[ing] the court in the least. Just believe it, because we're saying it. And I love the claim that your blog, which mostly posts court papers verbatim, isn't accurate. Ray, if the EFF is actually denied leave to file, would you be able to incorporate their brief into your own filing papers? Dear "Brian" and "Richard2", you complain that this blog is not notable for it's accuracy or fairness. I take the liberty to invite you RIAA guys to explain here why do you think that this is so. It isn't Mr. B. fault that what your clients are doing isn't fair! So when he journalisticly neutral reports about it that this might look as an unfair behaviour can't you guys seriously attribute to him. Maybe you should advise your clients to behave more civilised so their behaviour look fair to you both. And what is this about lack of notability of accuracy? Are the PDFs of your clients, he links to, inaccurate? Or do you complain that we the commenters make errors when we cite from them? Maybe you should provide him with real digital files where text is c+p able if you complain about lack of accuracy. That the content of these pdfs is not very accurate isn't his fault, but yours. You guys (or your ghostwriter "RIAA-Richard the first") write those! Oh, and with respect to your footnote. You guys aren't very accurate; you are oviously confusing affirmative defenses and counterclaim points with postings in this blog. What you guys claim in your footnote, I haven't read THAT so far anywhere in this blog! In countersuits yes, but not in the blog as a post of Mr. B. How dare someone tell the truth about us! "This blog is notable for its ferver and passion, but not for its accuracy or fairness." I have been following your blog for about a year now and have never seen you present inaccuracies. It's usually a combination of a short message stating the facts, a link to the actual filings in the case discussed and then comments from people who are NOT attorneys and admittedly so. To be honest, their example happens to represent my exact opinion of the entire entertainment industry which is probably why I have bought less than 5 new CD's over the last 4+ years. I do NOT download, but instead have shifted my money to independent and local artists and concerts. I'm happy to support artists that I like, but NOT happy to support antiquated business models that refuse to adapt to the times. I also firmly believe their attempt to cast P2P file sharing as "theft" IS a distortion of copyright law AS IT IS WRITTEN. As for frightening "ordinary working people and their children", do we really have to look any further that Patti Santangelo? I'm just grateful that she is the kind of person that fights back when frightened instead of rolling over and "playing dead". In regards to their contention that the amicus brief adds to the cost of the case, wouldn't their objection have the same effect? Don't you now have to spend time crafting a response and pending the judges decision, the brief may still be allowed? All in all, while I suspect it's not a true consideration, serious fiscal conservativeness dictates you allow the EFF to submit their brief and expect the judge to ignore it as the "fluff" they seem to think it is. In all honesty, I think they are afraid of what the EFF has to say. I have said "In these cases, a cartel of multinational corporations collude to abuse our judicial system, distort copyright law, and frighten ordinary working people and their children." That is my opinion, and it seems even more true today than when I wrote it. After reading the opposition brief again I have now concluded that: down is up, left is right, black is white, Democrats are conservatives, the opposite of blue is 17, and that the RIAA arguments make sense -- in some galaxy far, far away that I'll never visit. "I have never once read Ray accuse the RIAA of being a cartel"
Then you haven't read Ray's initial counterclaims to any case he defends. I can almost recite them off my head: estoppel, waiver, unclean hands, cartel-like activity, and RICO. In these cases, a cartel of multinational corporations collude to abuse our judicial system, distort copyright law, and frighten ordinary working people and their children. 9. The plaintiffs, who are competitors, are a cartel acting collusively in violation of the antitrust laws and of public policy, in an attempt to expand their monopoly power into the area of online digital music, by tying their copyrights to each other, collusively litigating and settling all cases together, and by entering into an unlawful agreement among themselves to prosecute and to dispose of all cases in accordance with a uniform agreement, and through common lawyers, thus overreaching the bounds and scope of whatever copyrights they might have. 10. As such, they are guilty of misuse of their copyrights. 11. 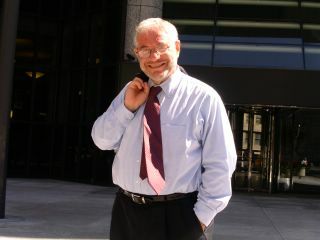 The plaintiffs have engaged in a conspiracy to defraud the Courts of the United States, by bringing lawsuits against persons who are not known to have infringed copyrights, and to make false and unsupported allegations that the defendants have infringed copyrights; by utilizing a corporation known as Settlement Support Center LLC to make extortionate threats of criminal action and of defaming defendants' names and credit; by conducting ex parte “John Doe” lawsuits which they have no intention of pursuing, but in which they interact with Judges, Magistrates, and other officials on a daily basis, without notice or opportunity to be heard being offered to defendants; by bringing the “John Doe” lawsuits in jurisdictions far removed from the domiciles of the “John Does” so that they have no meaningful opportunity to be heard or to retain counsel of their own choosing; by sending out press releases for the purpose of humiliating, embarrassing, and extorting; and by other unconscionable conduct. 12. As such, they are guilty of misuse of their copyrights. litigation lawyers for a party aren't usually "impartial"... who would want a lawyer representing them who is "impartial" about how the case turns out? I was refering to the blog itself in my remarks, r3m0t, and for that, I'm guilty of "foot in mouth syndrome". I also realize that the spin masters at the RIAA would ignore common sense when it come to Amicus briefs. Like amd fanboi said, the EFF's interest in this case is not only legal, and the motion should be granted, but would also provide another prospective in this case. Now granted, in my view, the EFF would say nothing new(sorry Ray), but what has the RIAA done to bolster their view? Have they brought a case to trial? Have they even been challenged to the point where they had to publically apologized for their misconduct? Above all else, have they even played fair and allowed the defendants to have their day in court when the John Doe suits were brought up? No, no and no. I have never seen a better description about what the law, and being a lawyer, is all about. I would maintain that the Public Domain is a party unrepresented in these cases. The Public Domain is actually a copyright holder. It is the party to whom all copyright reverts when the special rights and privileges over the ephemeral granted to original creators or the owners of any copyright, by laws are exhausted. Copyright is a special privilege granted by our laws to ensure orderly commerce and mutual benefit to publishers, creators and the general public. It is not one of those inalienable human rights which we all agree, all living humans are entitled to above and beyond any other specific laws to the contrary. If there is any inalienable right intended by copyright law, it is the inalienable right all humans have to the creative legacy we have inherited from our ancestors and which we leave to our future generations. Holders of copyright are in effect the guardians (temporarily) of some of humanities greatest creations. There is no lawyer in any of these cases representing the Public Domain. It is left to organizations like the EFF do attempt this amicus briefing. I hearby excuse myself before those 2 RIAA toadies. They did look accurately; What they quote is right at the left frame of every page. Holders of copyright are in effect the guardians (temporarily) of some of humanities greatest creations. While this may be true in many situations, as far as the RIAA is concerned... it's BOGUS. Has anyone looked at what passes for music nowadays? Some of the music people are being sued over is so pathetic and unoriginal, one would think it HAD to be downloaded, because who would pay any attention to it if it wasn't a free download? By the way, is it just me, or can we apply the definition of "terrorism" to the RIAA?